Towards the end of the cafe yesterday, I caught up with good friend, mentor and very wise lady, Jill. I shared stories from the summer, and my family, and how I was going to put my family in focus a bit more this season; trying to find more balance between cafe and family responsibilities. I asked her what she was up to. She shared how she’s bringing into focus much more the possibilities around Brexit, the concern about our blind sleepwalking into a completely new state for Britain, and her serious worry of the very real possibility of the rise in extremist views (of whatever persuasion). She didn’t need to go into detail about her holiday reading to tell me that there is a lot of literature out there comparing the current situation with pre-second-world-war Germany. Jill reminded me of what is at stake, and revived in me my passion for playing my part in making the world a better place, starting in our tiny little corner of it in LS8, Leeds. 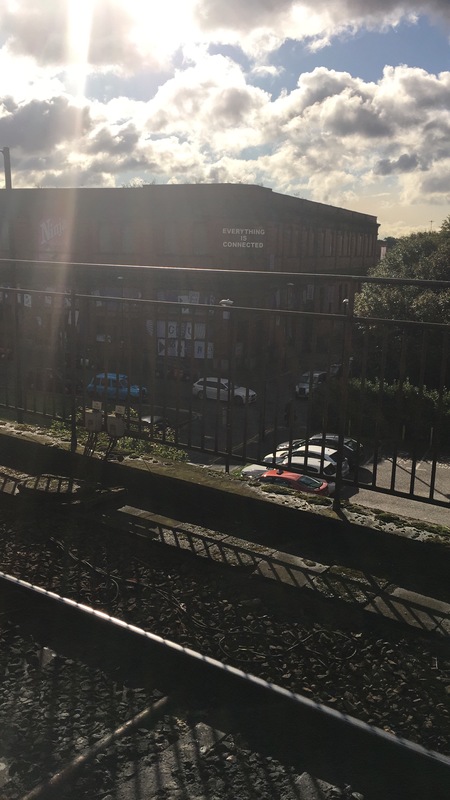 It’s not the best picture in the world, and incase you can’t read it, the sign on the side of the building on the other side of the train tracks reads, ‘Everything is Connected’. I saw it this morning, while waiting for a train at Manchester Piccadilly station, to take me to Salford Quays where a social enterprise centre was hosting us, the School for Social Entrepreneurs Trade Up programme, for the morning. Having been away from TLC for most of the summer (and a HUGE thank you and well done to Gina and the team for keeping it open and running), I was ambivalent about going on the course, I guess I hadn’t quite got my head back round to the agenda of building the TLC business up, (to be honest I’m just getting back into catching up on everything while I was away and getting back into the rhythm of it all) so I came today open minded, and with low expectations. And this evening, I am thinking that was the best way to be. The day has been so inspiring, so mind opening to possibilities, so many things on the to do list that (should!) be quite easy to implement but will have a big positive impact. By 2019, Britain will be a very different place to how it is now. Maybe, hopefully, some of that will be positive, but in the current climate where there seems to be legitimacy in extremist views; be they anti-Islam, anti-Semitic, anti-Tory, anti-anything, the importance of a place where everyone is welcome, where the culture is that of open conversation with someone new, of learning from the person with whom you are talking with, the stakes for TLC’s success and impact have never seemed higher. And just while finishing off writing this blog post, someone who I have missed dearly and deeply at the cafe, who was the inspiration and source behind it, who is the strength by my side, has just texted me to tell me that she will come back after a few months’ absence. She is the caffeine I need to really get ToastLoveCoffee doing what it needs to be doing, for as many people as possible, and to be part of the revolution for positive change that we so desperately need.